This contributor post was written by Michael Ann of Michael Ann Made. Hello Crafty Friends! 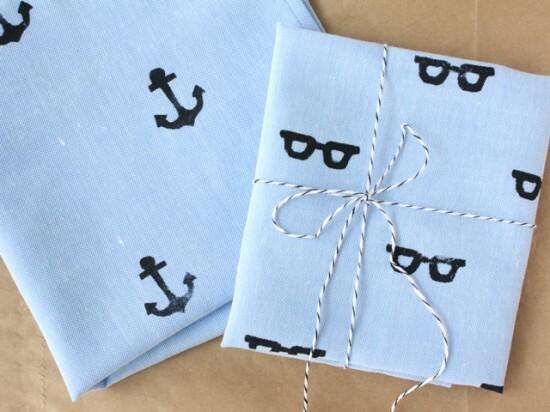 Today’s DIY is for a graphic Hand Stamped Handkerchief, easy enough to bust out as a last minute Father’s Day gift (wink wink!) and simple enough for even the youngest of crafters to help. Dads always love handmade gifts, especially when they also have elements of practicality. So let’s get stamping! 1. Sticky back foam for the Stamp. You can either cut out your own shape, or use pre-cut foam shapes found at the craft store. Pre-cut shapes would work well for kids to be able to help. 2. Something to put your stamp on. I used an old film canister, you could use a cork, wood block, bottle cap, etc. 3. A scrap piece of felt and a plastic tray or lid. This is how you will make the stamp pad. 5. A plain handkerchief. You can also make one quickly out of a square of fabric. 1. Prepare your foam stamp. 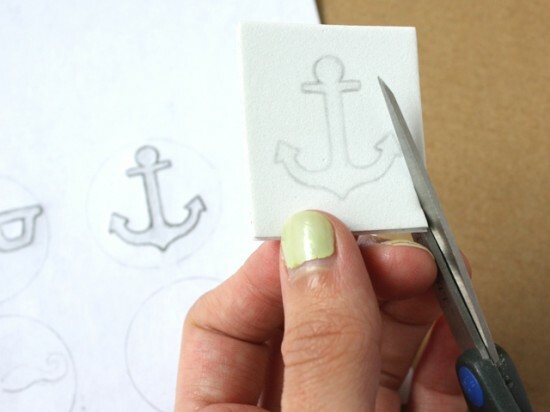 If you are drawing your own stamp, make it a simple graphic that can be easily cut with scissors or a craft knife. You first drew it on a piece of paper, then trace it on the foam to get it just right. 2. Make your stamp. Peel off the paper backing and stick your stamp to your stamping device. I also used a sharpie to mark a small dot on the side of the cap so i would know which way was up while stamping. 3. Make your stamp pad. 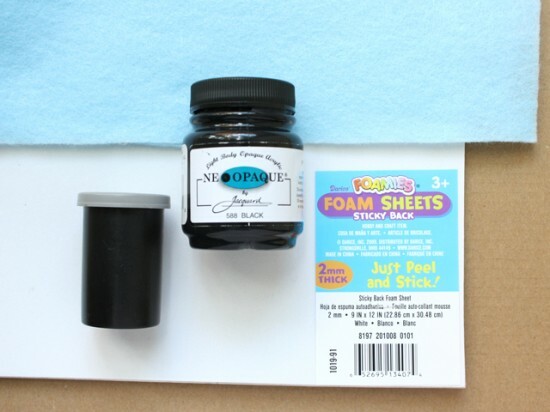 An easy way to make a stamp pad when using fabric paint is to put a good sized drop of paint on a plastic tray and then lay a piece of felt on top of the ink. 3 cont. Stamp at the felt until the paint bleeds through, and you have your own stamp pad! 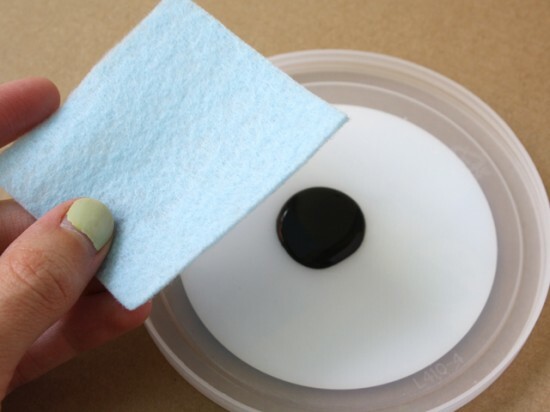 If during your project you find you need more paint, just lift the felt and add a couple drops of paint to the tray. 4. Stamp away! You can try to align your images, or just go for it freestyle. 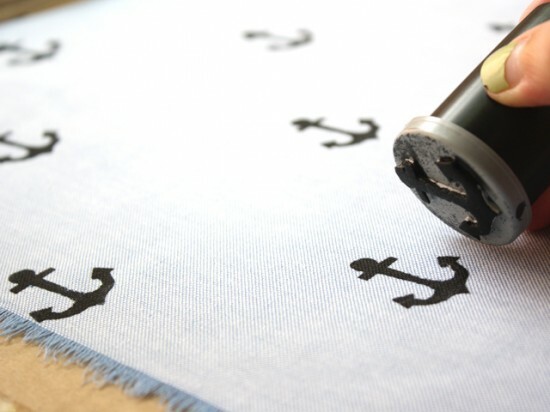 Letting some of your images bleed off the edge will make it look like the fabric was printed professionally. 5. Finish it off. 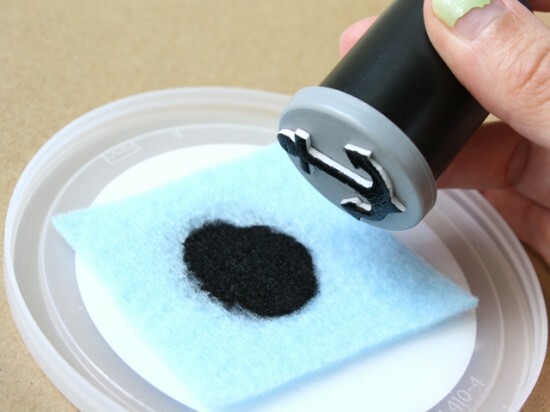 Most fabric paint requires that you let it dry for a couple hours, then heat set it with an iron before washing it. Follow the directions of your specific paint. Now you have a loving handmade gift that even the most practical of dads will love! Good luck stamping, and happy Father’s Day! Michael Ann is a sewer, knitter, crafter, thrifter, living a crafty life with her husband in Portland, Oregon. You can find her at her blog Michael Ann Made where she shares projects, tutorials, and bits of inspiration to help you live a crafty life too. You can also follow her adventures on twitter. I love it. It’s so easy and a beautiful gift idea. Not only for father’s day. I’m going to try it for my best friends birthday. Thank you for this inspiration. Hi Little empty room. Let us know how the project turns out! 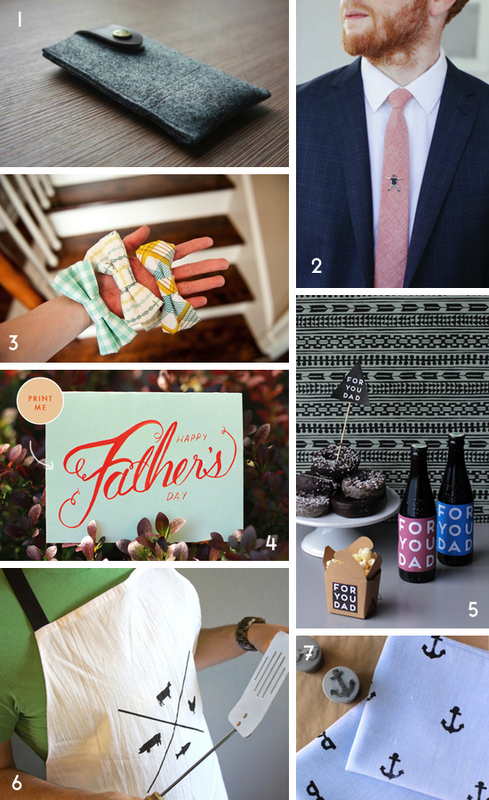 I agree – this DIY can be used for lots of other gifts aside from Father’s Day. I am thinking these would make great groomsmen gifts for a wedding. What do you think? Great idea! I’m now inspired. This technique would be great for lots of types of gifts. What a great idea, they look gorgeous and so easy. Thanks for explaining it so well for us! I <3 this idea. I will get my girls to do something like this for their dad! Thanks for stopping by Owl & Drum, Emma, Te. So glad to hear you like Michael Ann’s project for the month. Have a good one. I love Neopaque and Lumiere paints (Jacquard). I made t-shirts a few years ago using them. Seeing this project brought back some lovely memories. I absolutely agree with you Coral. Jacquard had awesome textile paints! I use them all the time. Thanks for stopping by! Hi Kimberley! I think I am going to have to get one of those glasses stamps that Michael Ann used for this. So cute! Thanks for stopping by! I love this technique using the foam sheets to create unique stamps! 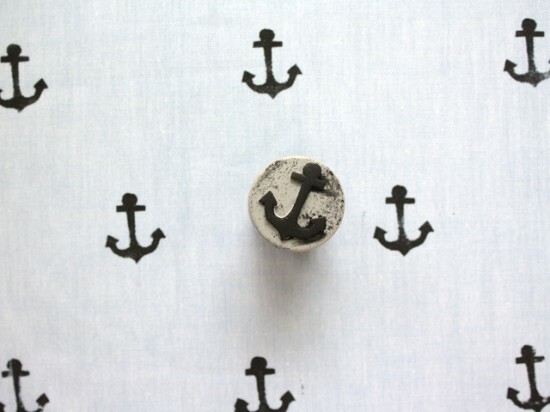 The anchor is perfect! Just posted on Craft Gossip!! Where did you find the anchor? I live in a water community and would love to know where you found it! Great idea! 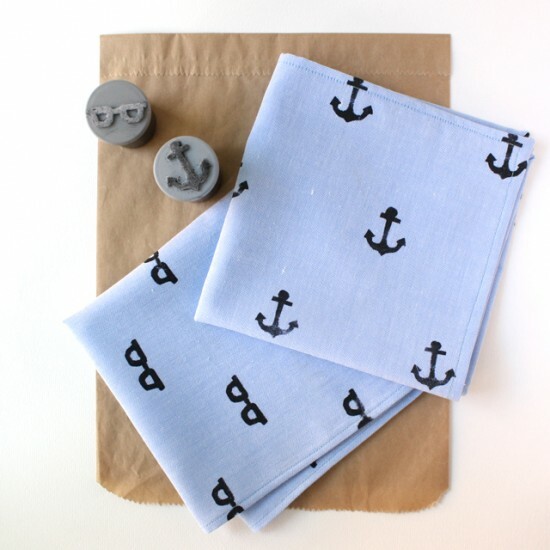 @lesliekeating have you seen this adorable fabric stamping project? 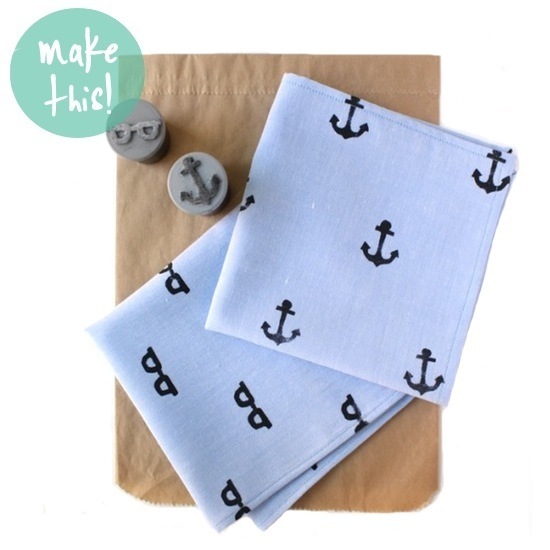 http://t.co/T2AL6Mlo i may try it out for the hand-printed fabric swap! hey michele! 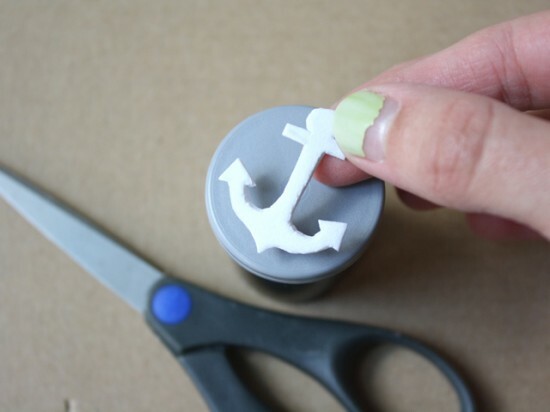 i actually just sketched out a little anchor from a picture i saw online, then traced the drawing onto sticky backed craft foam to make the stamp. it was really quite easy! i’m sure a quick search online could find you a cute stamp also, good luck! This is awesome!! cant wait to try it! Great tutorial too 🙂 thanks! and I’m going to make a couple more with different patterns tomorrow. and the only problem I faced was finding a good paint. to get a nice, brown mustachey color. Brilliant! Thanks for the tutorial. Awesome! My husband would love something like this and the kids would love to do it! Awesome! I was looking for a way to makes own fabric design and figured I wasn’t the first person to think of using home made stamps. Thanks so much for the great info. The DIY stamp pad is genius!!! Hi Nancy. You’d use fabric paint instead of ink for something like this. I get so many compliments on this craft! People always want to know where I got it, so I look mysterious for a minute and say “I made it”, but then refer to your website. Thanks so much for such a fun project!